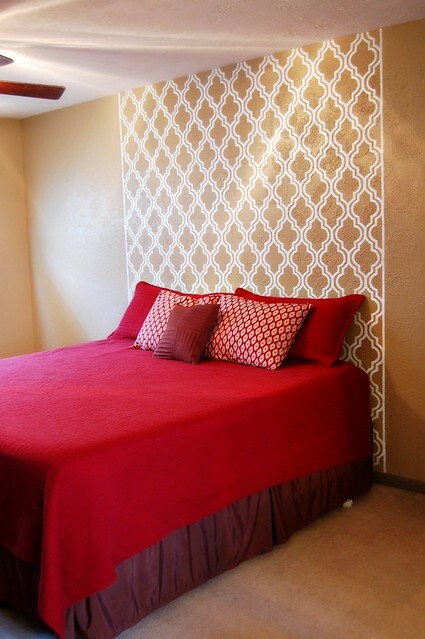 As soon as I saw the painted wallpaper tutorial by Emily on Jones Design Company, I dropped everything and started using her stencils to make a headboard. Seriously, right then. I was only partway through painting our bedroom in the first place, so now the freshly painted wall is sporting this painted headboard and I still have more than half the room to paint! 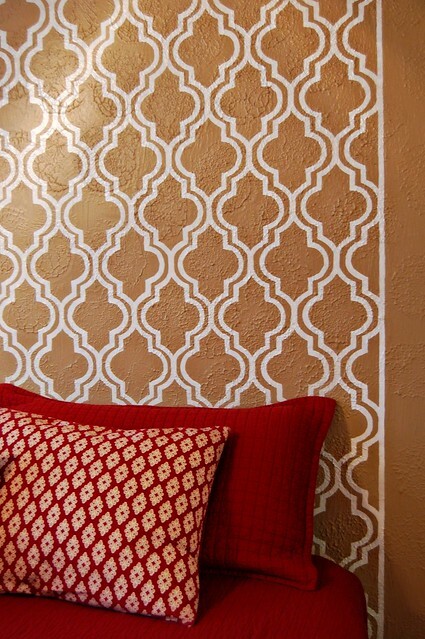 You should certainly visit Emily’s tutorial if you’d like to try this, but I thought I’d show you how I modified the stencil she created to paint just a portion of a wall instead of wrapping around the entire room. This helps to create a finished edge on either side of your painted area. I made four versions of the stencil to make the painted headboard, one of the full design, one that was halved horizontally for the top and bottom rows, one that was halved vertically for the sides, and one that was quartered for the corners. These pieces aren’t exact halves, though. I wanted the thickness of the lines to be equal all the way around, so I made each cut piece large enough to have a full line of paint along the cut edges. Since my paintbrush was about a half inch wide, the cut edges are about a quarter inch wider than if they’d just been cut in half. 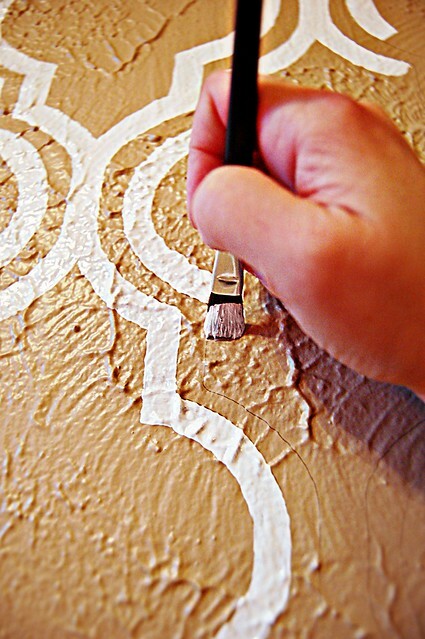 Also, Emily stated she has a good “sense of straight” and just traced the stencil as she went along without leveling it. I am not gifted with a sense of straight, so I drew a line down the middle of the main stencil and checked the vertical level each time. Maybe twice I had it just right. Many, many hours later, stand back and admire your handiwork. Paint the rest of the walls! Decide what to do with plain bi-fold closet doors — paint, replace … ? And be sure to click below to check out an amazing gallery of painted wallpapers, so many beautiful ideas! This was CHEAP to do, I already had some spare paint, the stencil is free from Jones Design Company, and if I hadn’t had to buy a new torpedo level ($10) this would’ve cost nothing but time. I love free decorating! Thank you, Jackie! I love your “happy place” painted wallpaper desktop so much that I’m thinking of painting a wall in my living room with that design. It’s a simple design with such a lovely outcome, and classic enough not to go out of style. Loved it! Thanks for your sweet comment yesterday. 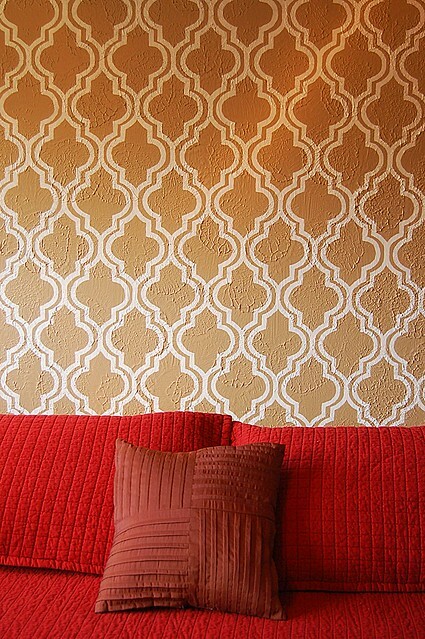 I’m sure if you wanted to do this pattern you would find it actually easier than the headboard design. You did such a great job with it and it looks more complicated to me. I used a round bowl to make the circle template and then found the middle points at the top, bottom, and sides. Then I used the same bowl and made four little semi circles connecting those middle points. I’m not sure if I’m saying that in a way that makes sense. 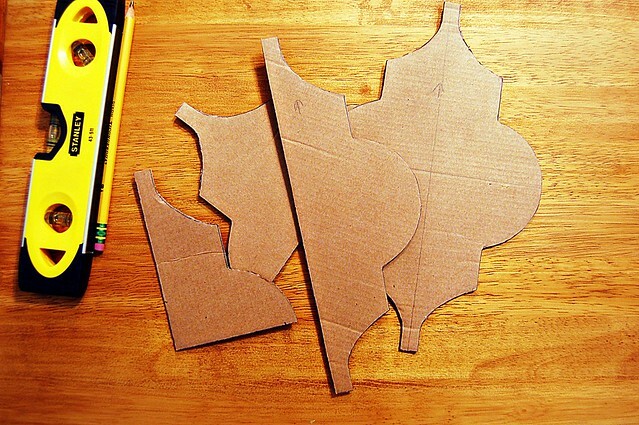 But then I was left with a diamond shape in the middle that I cut out as a template and traced inside each circle. It winds up creating sort of a continuous circle pattern that looks like butterflies or crosses to me depending upon what angle I’m looking at it. Oh, bless you for coming back and telling me that,Jackie! I’m not sure I would have figured out the bowl trick, and now I could have pretty much any size I wanted! Hmmm, I really think I’m going to have to do this! (I’ll make myself finish the bedroom first.) At some point in the future I’ll pop back in on your post and leave you a link to see what you inspired! Thank you, Anne! Just visited your blog, I love your green and gray nursery! The elephants you made ( http://christopherandanne.blogspot.com/2011/03/nursery-elephant-art.html ) are adorable! Hi, Donna! Oh, I’m so sorry you’re having trouble with your paint! I wish I had some helpful tip for you, but I just used some leftover semi-gloss trim paint and a cheap half inch wide brush. I had to go slowly because of the textured walls, I don’t know if that might have made a difference. I wonder if trim paint like I used might help? It was slightly thicker than regular wall paint, and the semi-gloss gives a nice effect and went on smoothly. I hope you’re able to save your project and be really proud of it!